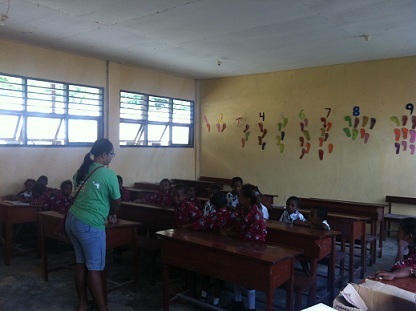 One of the Papuan students saying hello to the volunteers whocomes to school to help with the teaching. Teaching is so much fun here. Doing activities with kids while they are in school. Counting numbers in English, learning the alphabet and English conversation with volunteer are just some of the lessons that we gave to them. 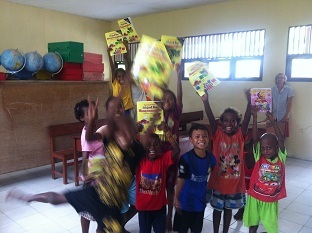 It is so much fun, because we using the unique way to teach them. For example, we let themdraw what they see around the island. 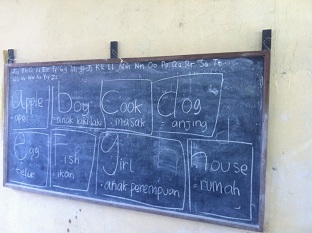 Then they ask Githa as the teacher and volunteers what the word is in English. 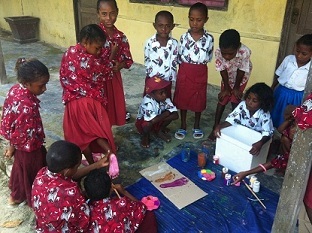 We also teach them using educational tools, such as a school books, notepads, drawing pens, water painting etc.. all this is paid for from the volunteers expedition fee! How about the volunteer, what do they do ? The volunteers are heavily involved in what the kids are learning that day. 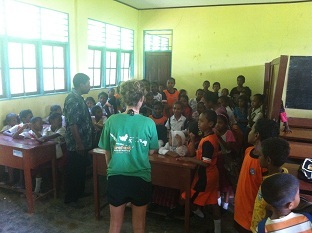 With games, the volunteers ask the kids one by one to remember what they just learnt. Or, if the volunteers have another idea for teaching it is always appreciated and very helpful. Githa will be so excited and of course all kids too. We currently have three schools we teach in, Yanbuba, Yenbekwan, and of course Arborek. The kids in every village are beautiful and so full of energy. One of the program now is a Drawing Competition. From this competition, we hope that every kid can express what they have learnt about their surroundings in English. 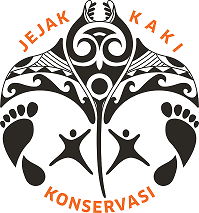 And for sure, community merchandise (such as T-shirts or Keychains) to be sold to tourists for the community fund and all designed by kids! In Arborek, we have already started our teaching English to adults programme. For the first lesson, the adult were very shy, more than the kids. But, no worries. They were lovely. We made a group of adults for every volunteer that wanted to help teach a class. Every group was 3 – 5 persons. So now every time we have a class, we have same students. Isn’t the great ? 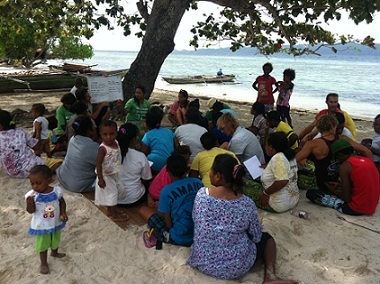 You to can be a part of the kids and adults English Development, simply by joining an expedition. Sounds great if you can help them have a better education and prospect in life through teaching them English? Then come join us…the kids are waiting….